Create the perfect picture wall clock in minutes! Fast and Easy! Comes with 12 wooden frames, template paper and all hanging accessories. Package include: frame template paper, hangers and pin hooks. Photos not included. 1) Place template paper on wall and mark locations for hooks. 2) Remove template and fasten hooks to wall. 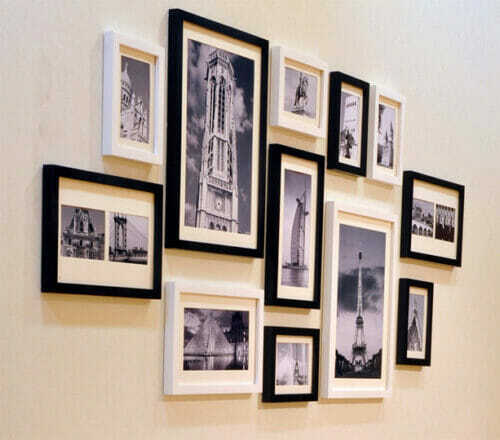 3) Hang the frames on hook. Easy! Great experience with this seller! The product is exactly as described. Good quality! Shipped on time. I would definitely buy from this seller again. So happy I decided to buy these frames instead of trekking to Ikea! Gorgeous, and super easy to assemble. If I decide to add more frames to my gallery wall, I will definitely buy from HOMELOO again. Thank you so much! Shipped on time. Beautiful light frames.